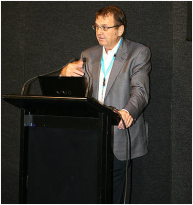 MARCS BabyLab Leader, Professor Denis Burnham and BabyLab researcher, Dr Marina Kalashnikova, recently presented at the Learning Differences Convention in Rosehill, Sydney. The Learning Differences Convention is targeted at teachers or parents of children with diagnosed learning difficulties, or simply those children that are struggling at school and need a helping hand. Professor Burnham and Dr Kalashnikova discussed research being conducted at MARCS BabyLab concerning literacy and dyslexia, but also held an open forum for sharing and gathering information from the audience regarding their experiences with dyslexic children. They heard from teachers, parents, and other interested parties on their experiences with dyslexic children and views about dyslexia, and listened to comments and input from the audience on the two parts of the 'Seeds of Literacy' project. The ongoing 'Seeds of Literacy' project, funded by the Australian Research Council, is concerned with identifying early indicators of later literacy, and dyslexia. The project has two main parts. The first involves a five-year longitudinal study in which 120 infants (60 control, 60 at-risk for dyslexia, by virtue of having at least one dyslexic parent) are followed from five months through to five years. The second part of the project incorporates cross-sectional studies at particular older ages: toddlers 14 to 24 months and school-aged children aged six to 12 years. Pre-school children who are at risk for dyslexia (by virtue of having at least one dyslexic parent), school-aged children who are showing indicators of dyslexia, and children who are not at risk for dyslexia are studied in the second part of this project. Thanks to Denis and Marina for taking the time to communicate the benefits of this research with our community at such an important convention. 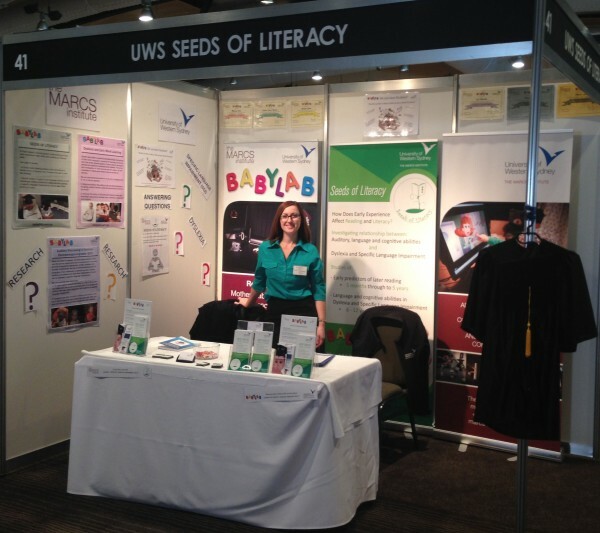 Dr Marina Kalashnikova fronts the MARCS BabyLab stand at the Learning Difficulties Convention. MARCS BabyLab leader, Professor Denis Burnham, addresses the audience at the Learning Difference Convention. 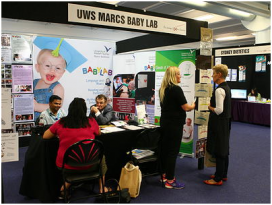 The MARCS BabyLab stand at the Learning Difference Convention.